LEGO bricks aren’t a set of 3D software used to build incredible movie scenes. But apparently LEGO has the potentiality to create a virtual world such as the inconceivable folding world in Inception. No doubt, the folding street is one of the most classical scenes in the fresh sci-fi movie Inception. As we have seen, the scene has been replicated by the LEGO model built by infomaniac, a LEGO artist. 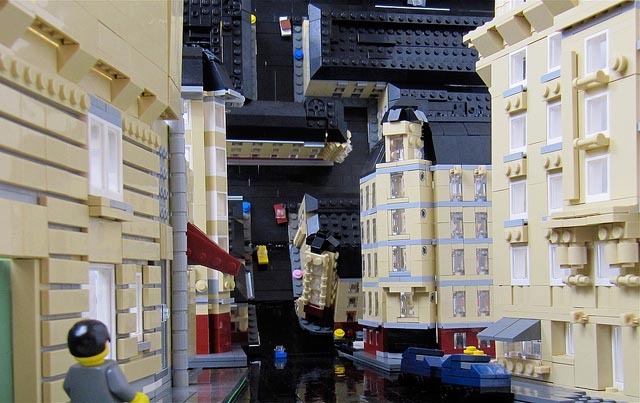 Although the LEGO scene doesn’t have much more details than the original scene in the movie, yet it clearly expresses the concept of the unreal world, using minifigures, buildings, cars, and folding streets. Of course, all these details are built with LEGO bricks. Additionally, the scene isn’t the only one LEGO creation themed by Inception. If you’re interested, please check another set of LEGO Inception scenes.